On the last track, we discussed how to create a Driving Stress Profile for Anger Management clients who experience road rage. Also, I presented a technique for driving less stressfully entitled "An Enjoyable Driving Experience". As discussed on Track 2, drivers who have made rules and value systems for themselves on the road seem to experience more stress than others who do not have their own system of beliefs. Often, this can lead to a stress disorder and in clients ordered into Anger Management, a worsening of their condition. On this track, we will examine the effects of stress on Anger Management clients: increased irritability; less control over impulses; and susceptibility to paranoia. We will also include "The Driver Relaxation Breathing Exercise" to help stressed clients relax. The first effect is increased irritability. An Anger Management client’s desire for un-expected rage and hostility is a trademark symptom of the disorder. 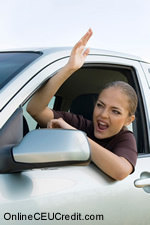 When an Anger Management client then faces more stresses on the road, his or her irritability becomes more susceptible to trivial matters, as you know. These stresses come from the four rules we discussed earlier that many drivers hold true to. Once an Anger Management client feels that his or her rule is being violated, he or she becomes more and more likely to exhibit bouts of rage. Joanne was a 21 year old client of mine who was court ordered into an Anger Management program. Joanne stated, "I get really upset when people push me around on the road. I mean, I’m already on edge when I’m out of the car. Sometimes, I’ll snap for no reason. Some of my friends won’t drive with me because I won’t listen to them. They try and tell me that whatever I’m mad at isn’t that big of a deal, but it’s like I don’t even hear them." As you can see, Joanne’s increased irritability became more and more prevalent and sensitive when she felt threatened while driving. This made more likely her chances of running into a hostile situation. A second effect is less control over impulses. As you are aware, impulsivity is a symptom of Anger Management that is difficult to cope with. Anger Management clients will jump at any impulse without considering the consequences. When faced with stress, this propensity to act with little provocation becomes more acute. Shannon was a 22 year old client of mine who was prone to impulsive acts. One day, Shannon was driving on the highway. That particular time of the day happened to be rush hour and many cars were on the road. Because of all the extra traffic, Shannon began to feel upset and closed in. She didn’t know quite how to handle the situation, and she wanted the other drivers to stay away from her vehicle. At that time, Shannon had been drinking a milkshake which was already half-full. She stated, "I really don’t know what came over me, but my hand just started moving and I grabbed the shake. I rolled down my window and hurled the cup onto the highway, and it hit another driver’s windshield. I then started throwing stuff like paper and whatever I had in my car. I could have really hurt somebody." As you can see, under a great deal of stress, Shannon responded with an impulsive act. Think of your Shannon. Does he or she respond under stressful situations with impulsive and dangerous acts? In addition to increased irritability and less control over impulses, a third effect of stress is a susceptibility to paranoia. It has been theorized that many of an Anger Management client’s hostile acts come from a primary reaction imprinted in the amygdala. When a client experiences a trauma, such as abandonment, early in life, and reacts in a certain way, the amygdala registers the emotions felt during the trauma and the reaction. Therefore, when, later in life, a client experiences a traumatic feeling again, the amygdala reacts in a split second and favors the primary reaction it learned early on in development. Because the amygdala reacts much faster than the neocortex, or the reasoning portion of the brain, the client, if their primary response was anger, acts angrily and without the information having been sorted through yet. This learned reaction can also cause a client to be more alert and less trustful towards people, resulting in paranoia. Have you found like I that one of the key characteristics of an Anger Management client is black-and-white thinking in relation to interactions between other people. The Anger Management client, when in an interpersonal relationship, will go through a period of idolization of the other person. The client will think very highly of their friend or spouse, but if that friend or spouse in some way offends the client, the client will immediately devalue the other person. In other words, an Anger Management client switches between extreme affection and outright disdain. On the road, this can cause paranoia problems because any other driver who seemingly threatens the client becomes an immediate enemy and the client reacts. Joseph was a 20 year old Anger Management client. During a trip home from work one day, another driver cut him off on the road. Joseph, who had been under considerable stress at work, became convinced that the other driver was somehow threatening him. Joseph pulled up beside the driver in the lane coming from the other direction. He then proceeded to run the other car off the road. Unfortunately, Joseph was not looking for cars coming the other way and this resulted in a head-on collision. Joseph stated, "That guy had it coming. He was out to get me from the start and knew what was going to happen next. I guess I may have taken the bait, but he was really trying to get me riled up." As you can see, Joseph believed that the other driver was "out to get him", even though Joseph had never seen this other driver before in his life. Breathe in slowly, counting to five. Breathe out slowly, counting to five. Breathe in more deeply, counting to five. Breathe out more slowly, counting to ten. Breathe out more slowly, counting to fifteen. Breathe out even more slowly counting to twenty. I find that this breathing exercise will not only relax a stressed Anger Management client, but will often give them to time to think about their reactions instead of resorting to impulses. On this track, we discussed the effects of stress on Anger Management clients: increased irritability; less control over impulses; and susceptibility to paranoia. We also included "Anger Management Relaxation Breathing Exercise" to help stressed clients relax. On the next track, we will examine steps necessary to replace the Anger Management clients' predetermined rules of the road with less stress-inducing rules: discussion; attitude change cards; debate; and relaxation exercise. What are three effects of stress on Anger Management clients? To select and enter your answer go to Answer Booklet.